The Patagonia Houdini Women’s Trail Running Jacket is pure magic! Weighing in at a scant 3.6 ounces, the Houdini offers protection from wind and light precipitation making it the perfect lightweight stash jacket for trail running adventures. 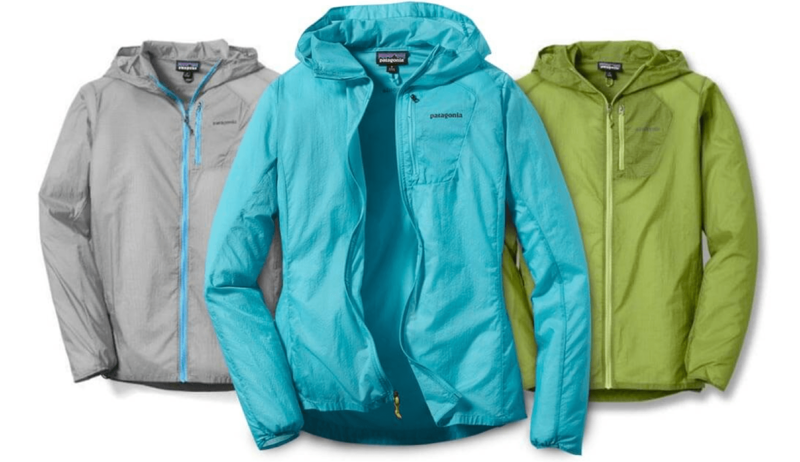 Made from 100% ten-dernier nylon ripstop, the Patagonia Houdini is incredibly lightweight and durable. The DWR (durable water resistant) coating repels light precipitation and dries quickly. The hood easily cinches around the head and face with its one-handed adjustment and elastic cuffs and a drawcord in the hem seal out drafts. The Houdini easily stuffs into the front chest pocket and can clip to your hydration pack or stash in your pack. I recently wore the Patagonia Houdini during Montana’s rugged Rut 50K trail race and was absolutely thrilled with the jacket’s performance. The temperature was 35 degrees at the start and I stayed pleasantly warm for the first few hours with nothing but a tank and arm warmers underneath. The jacket was very breathable and offered sufficient protection from the wind on breezy peaks. The Houdini is slim fitting so there’s not much room for more than a baselayer underneath. Although the Houdini offers plenty of protection from light rain and snow, it won’t offer much protection in steady rain or a downpour. For heavier rains and snow I recommend the Marmot ROM Jacket or a hard shell made to withstand seriously wet weather. All in all, I am happy I made the purchase! The jacket is easy to stash for runs and rides and offers sufficient protection for the types of runs I want to do. It is comfortable, breathable, and I like the slim fit. Best part is that the jacket is quiet when running, no swoosh swoosh here. The perfect running jacket, great combination of weight, fit, and simplicity, I got one in Navy Blue color and I love to wear it.